Hey guys! I hope that you had a fantastic weekend. Mine was okay…having some issues with my A/C unit so I am so happy that the temperatures here in Georgia are not as hot as they have been over the last month. That makes this situation a whole lot more tolerable. If you are reading this, I am sure that you noticed my new blog design (insert BIGGEST smile ever)! I am so in love with it. Fresh starts give me so much inspiration. I hope that you love the design as much as I do! I keep visiting the site because I just love looking at it. Oh, and I am no longer a.blogspot, I am now a .com:) Changes everywhere and change is good! Now, on to what we are here for today. I am here to show you guys some guest room ideas that I have been working on. 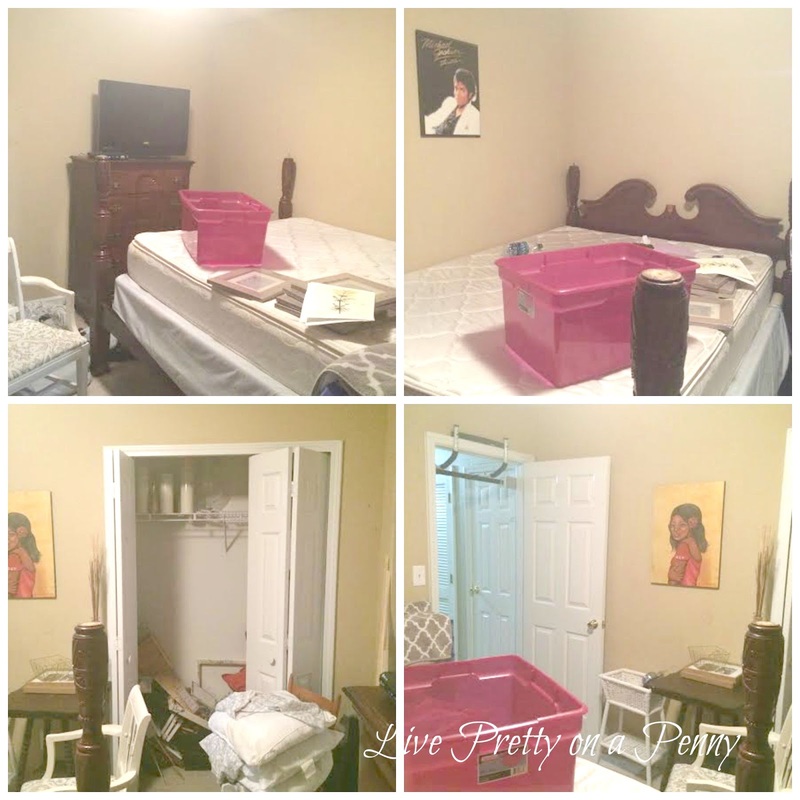 To give you a bit of an idea about where this whole guest room makeover came from, I won a makeover contest, which includes a big box store gift card, a Visa gift card, paint samples of my choice, and it has forced me to finally tackle this eyesore with the help of my prizes! I know. I should totally be ashamed. It doesn’t normally look like this, especially when guests come by, but overall it is really drab. But that will soon change! Based on these feelings, I wanted the room to feel updated, bed and breakfast like, and serene. Here is the board that I came up with. I love visiting quaint hotels that feel bed and breakfast and cottage like so I wanted to semi-incorporate this style into my guest room, but in a way that fits into the style of my home. There are some things that I will do in the room that are not addressed on this board, and some things that are addressed may change along the way. For example, it’s not addressed in this board, but I am pretty sure that I will be breaking up some of that green, with possibly navy blue, orange, or another color. We shall see. I am so excited to get started and plan to share snippets along the way here and on Instagram, so make sure that you are following me over there. I have about a month to complete this project so I guess I should go get started!! First up? Picking the perfect deep gray wall color. Then finding the perfect green for the tall dresser, as that this the color that I am leaning toward painting it. Are you working on any room projects? Got any cool guest room ideas that your guests love that you want to share? Spill it! Lol. 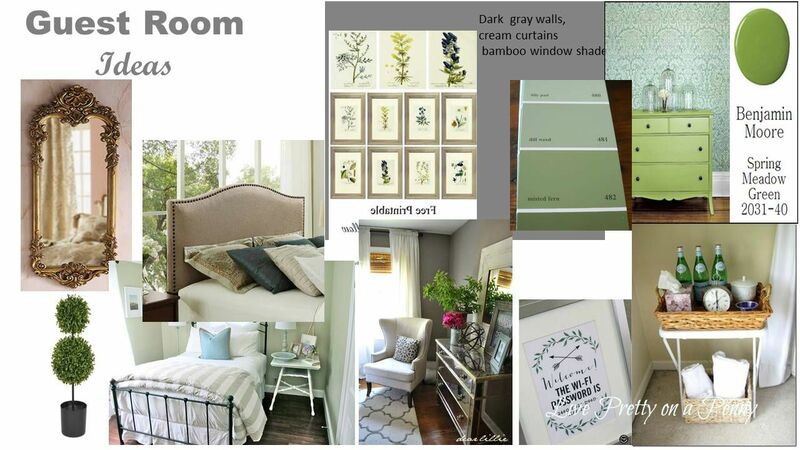 I like the direction you are going in for your guest room! I know it will look wonderful!